Written by Felipe Azenha & filed in Commercial, Events, Interviews. 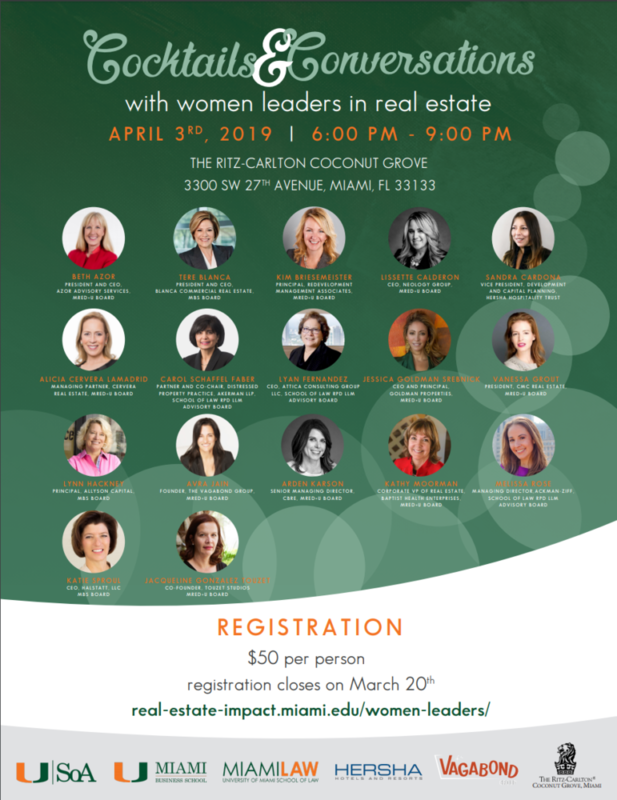 Here is your opportunity to rub elbows with some of Miami’s most influential women in real estate. This event is a unique opportunity to meet in small groups with the women board members from the MRED+U Advisory Board, Miami Business School Board and the School of Law RPD LLM Board. The format will be a speed-mentoring event where each board member has a single topic per table and attendees rotate tables (four table rotations of 20 minutes each). Written by Felipe Azenha & filed in Commercial, Development Pipeline, Events, Urbanism. Full disclosure: Steve was my professor while I was enrolled in the University of Miami’s Masters of Real Estate Development + Urbanism program. Steve is legit and a great teacher with decades of commercial real estate knowledge. A real estate Jedi if you will. What type of developer do you want to be? As the third generation in his family to specialize in commercial real estate, Stephen has a diverse background in not only executive leadership, but CRE service lines including investments sales and leasing brokerage, development, debt and equity capital markets, project management, strategic planning, asset and property management, receiverships, training and education. 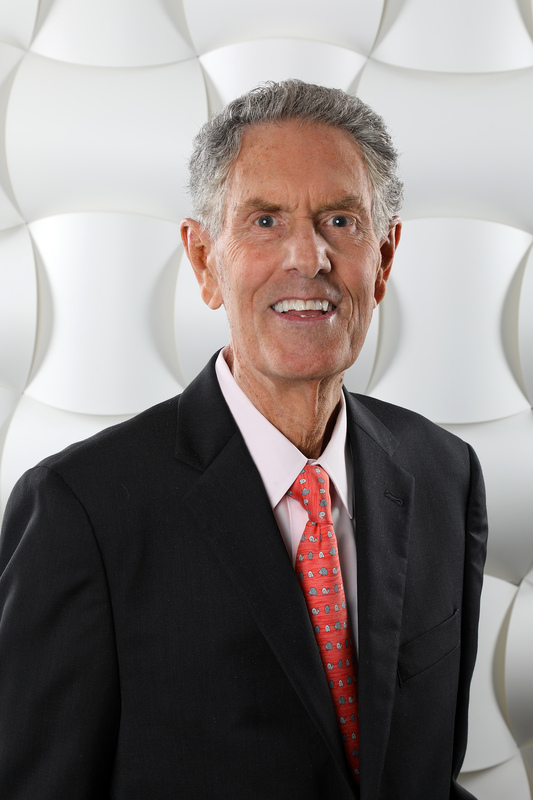 Prior to joining ONE Commercial Real Estate, he was CEO/COO of NAI Miami and CEO of the Colliers International South Florida office. Mr. Nostrand is a professor in the Master of Real Estate Development + Urbanism program at the University of Miami. Written by Felipe Azenha & filed in Community, Cyclists & Pedestrians, Urbanism. 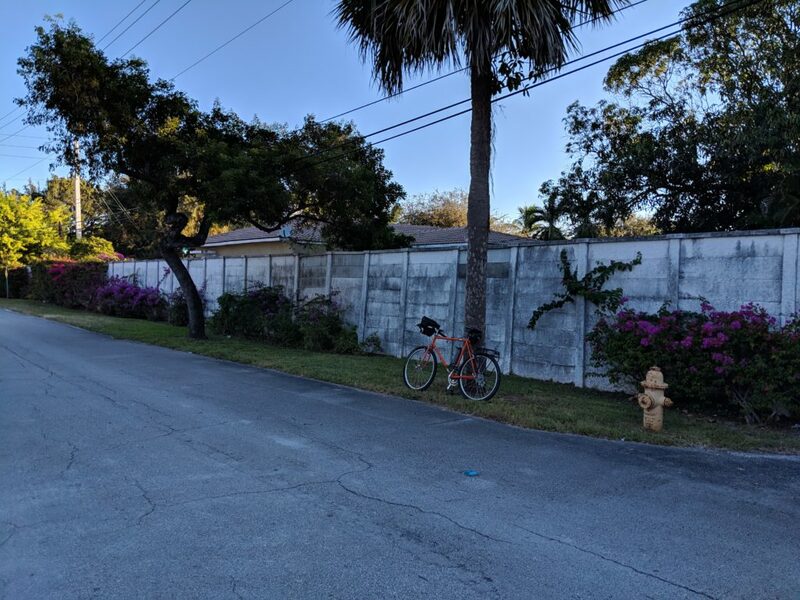 According to the 2019 Dangerous by Design report by Smart Growth America, Florida is the most dangerous state in the country for pedestrians and cyclists. 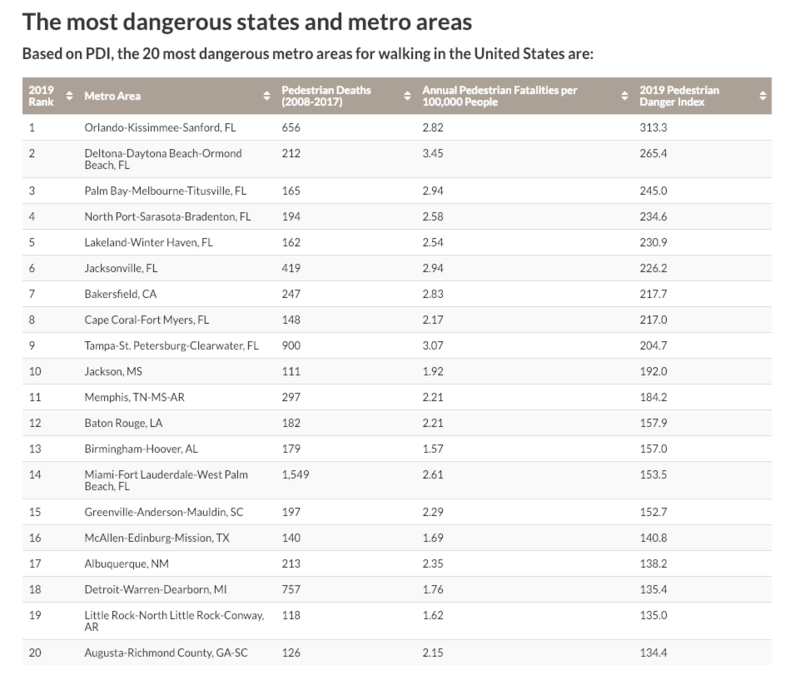 In fact, of 9 out of the 20 most dangerous metropolitan areas in the US are in Florida. 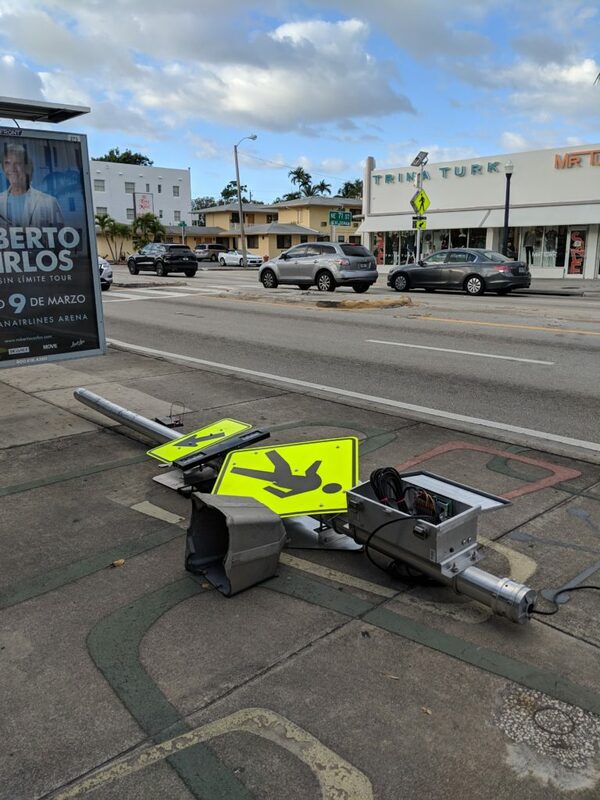 My family and I have lived in Miami’s Belle Meade neighborhood for the past 9 years and we have witnessed no less than 70 crashes which have resulted in cars hitting midblock crosswalks, light posts, bus shelters, traffic signs, medians, trees and people at very high rate of speeds. 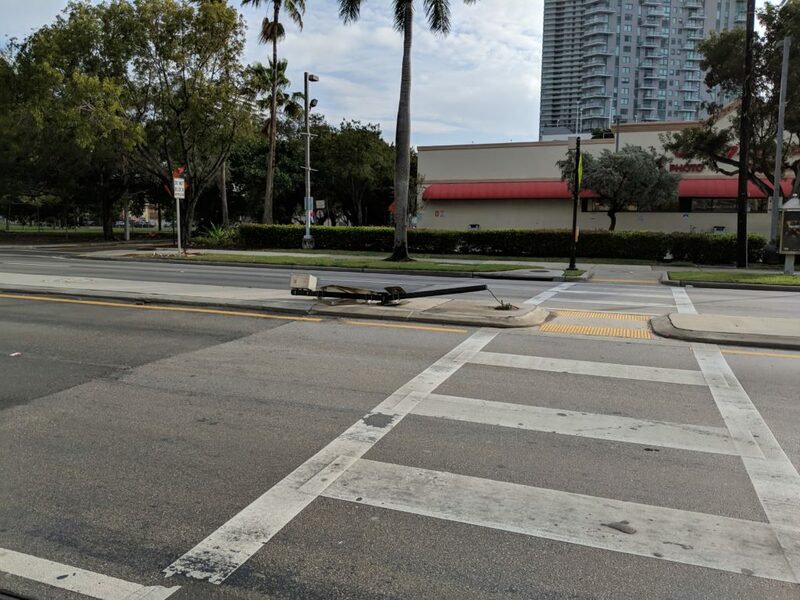 Several months ago my 5-year-old son and I were struck while crossing Biscayne Boulevard, in a midblock crosswalk, that wasn’t working properly because it was hit by a speeding vehicle over a year ago and never repaired. In addition, according to the FDOT’s data there were at least 2,553 crashes reported from January 2011 to July 2018 from (36th Street to 87th Street). During that time at least 64 pedestrians and cyclists were involved in crashes according to the FDOT. When the FDOT redesigned Biscayne Boulevard about 15 years ago, the focus was to move cars as fast as possible. 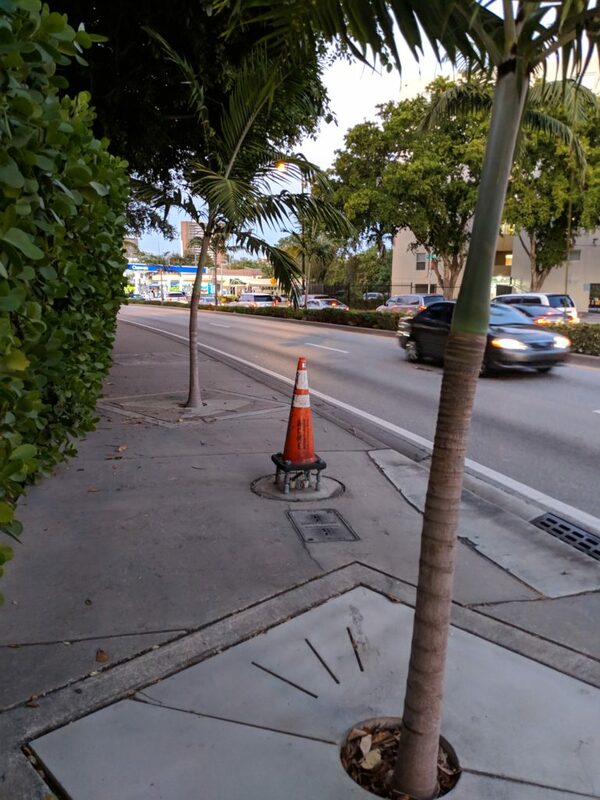 Very little thought and consideration was given to the safely of pedestrians and cyclists when we redesigned and resurfaced Biscayne Boulevard. 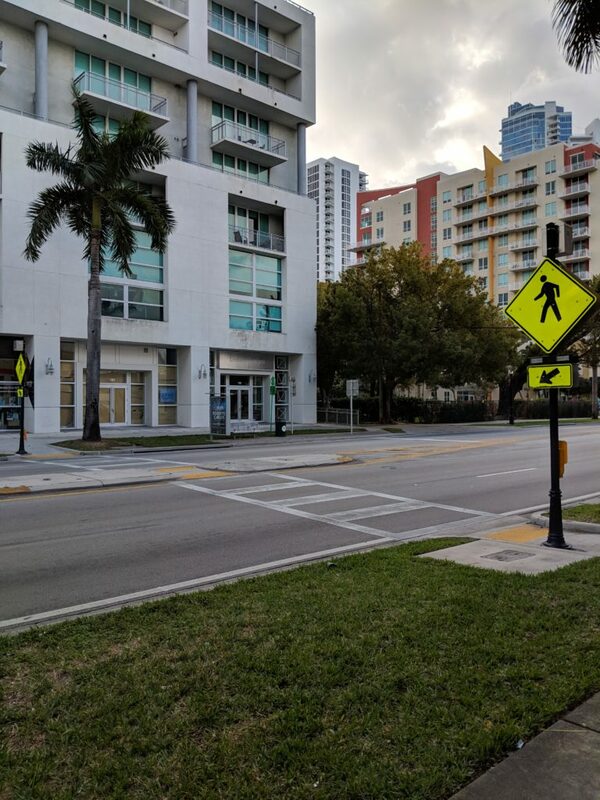 There are many areas along Biscayne Boulevard that do not have a crosswalk for 3 or 4 blocks. In some cases there is only 1 crosswalk every 5 or 6 blocks. There are also many sections along Biscayne Boulevard where cars are moving at 45+mph within 2-3 feet of pedestrians. We can do better than this. Our problem with Biscayne Boulevard lies in its design speed. “Speed limits are not necessarily known during the design process of a new road as they are determined after the roadway is built by evaluating how the motorists use the roadway. The speed limit on Biscayne Boulevard is 35 mph, but its design speed is closer to 45mph. If we want to make Biscayne Boulevard safer, seems like the speed limit and design speed should not exceed 30mph. 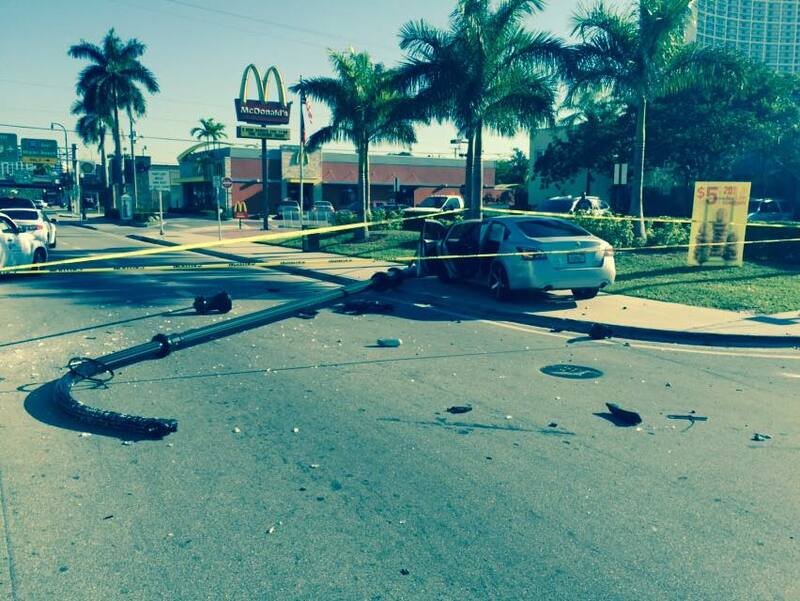 How can we make Biscayne Boulevard safer? 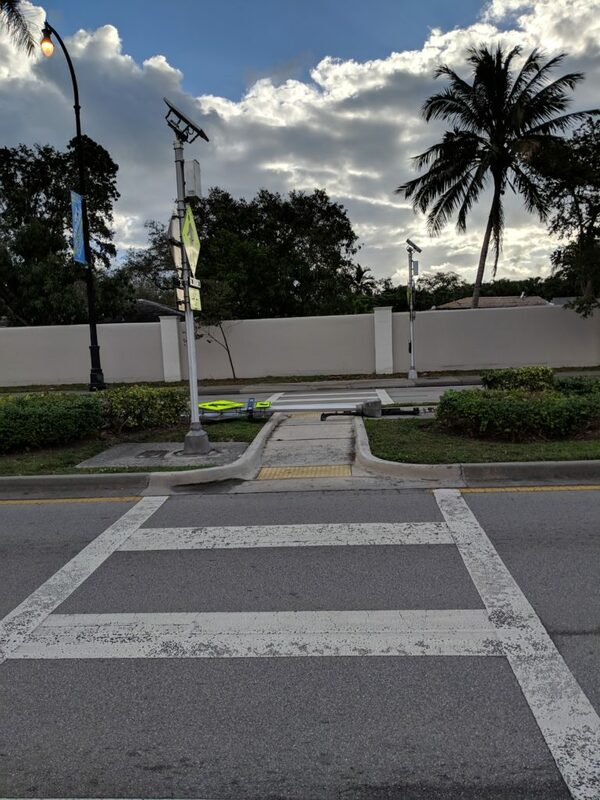 Luckily there are inexpensive traffic calming strategies we could implement rather quickly that would help reduce the design speed along Biscayne Boulevard. If some variation of these strategies were to be implemented, our main street would be safer for everyone (including drivers). Reduce travel lane width from 12 feet to 8 or 10 feet. Add on street parking. On street parking serves as a buffer and protects pedestrians from moving vehicles. Please join the Biscayne Boulevard Community at Legion Park on February 23rd at 11am to meet with the FDOT and walk Biscayne Boulevard. There is yoga in the park at 10am and there is also the Saturday Farmers Market. Bring the family and let’s work together to make Biscayne Boulevard safer for everyone. 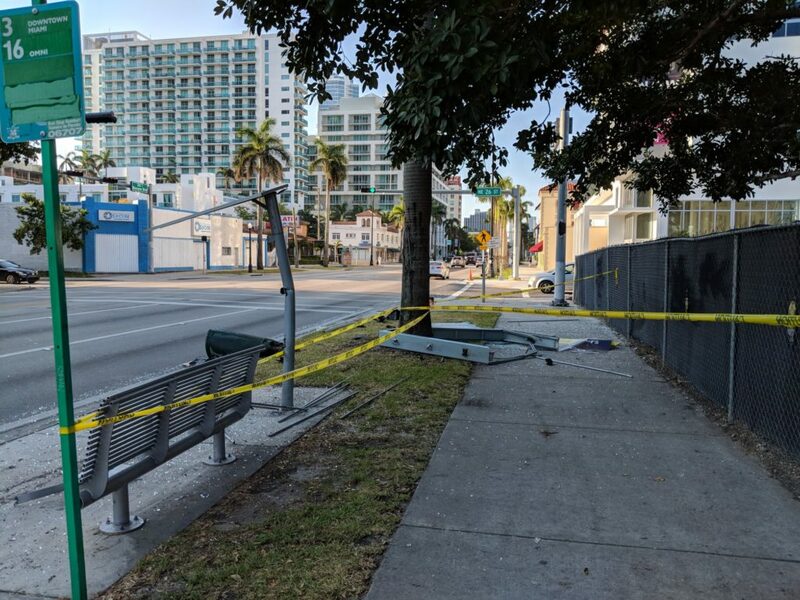 Below are images of Biscayne Boulevard crashes involving mid-block crosswalks, light posts, bus shelters and traffic signs. 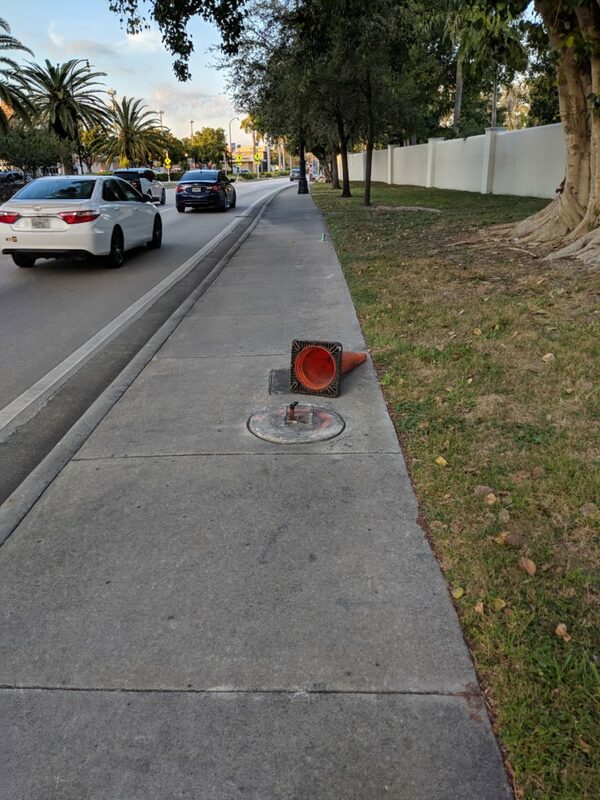 Many of the light posts and mid-block crosswalks have been broken for over a year and have not been repaired. Written by Felipe Azenha & filed in Community, Cyclists & Pedestrians, Quality of Life, Urbanism. 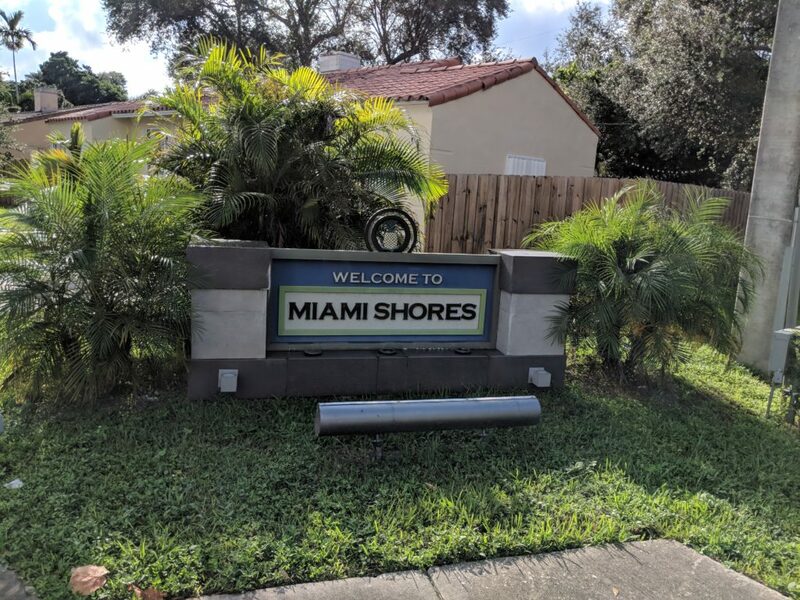 Miami Shores Village is located just north of the City of Miami. This mostly single-family community has a population of approximately 11,000 residents. Miami Shores can be considered to be relatively wealthy with a median household income of about $100,000. The village is surrounded by much poorer areas to the North and West which are part of unincorporated Miami Dade County. 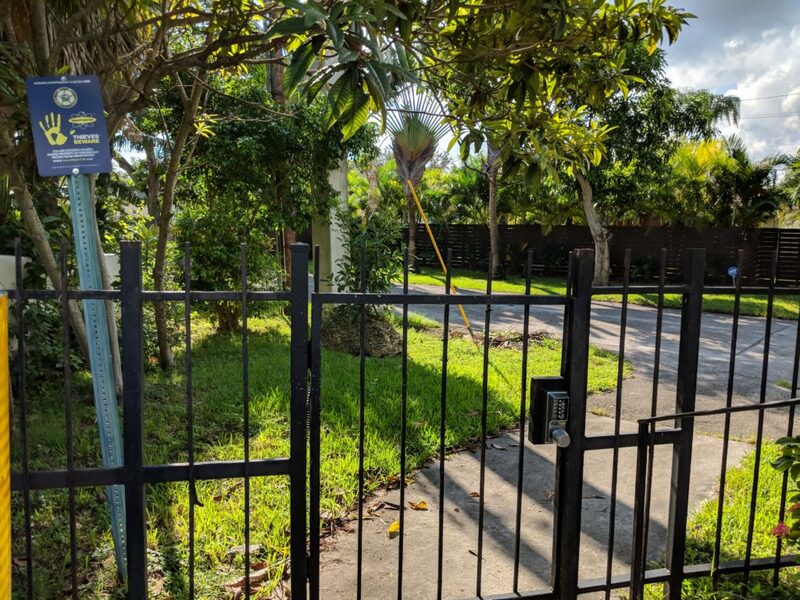 Many years ago, the residents of Miami Shores Village decided that it would be best to surround themselves with walls, fences, and gates (with combination locks!) 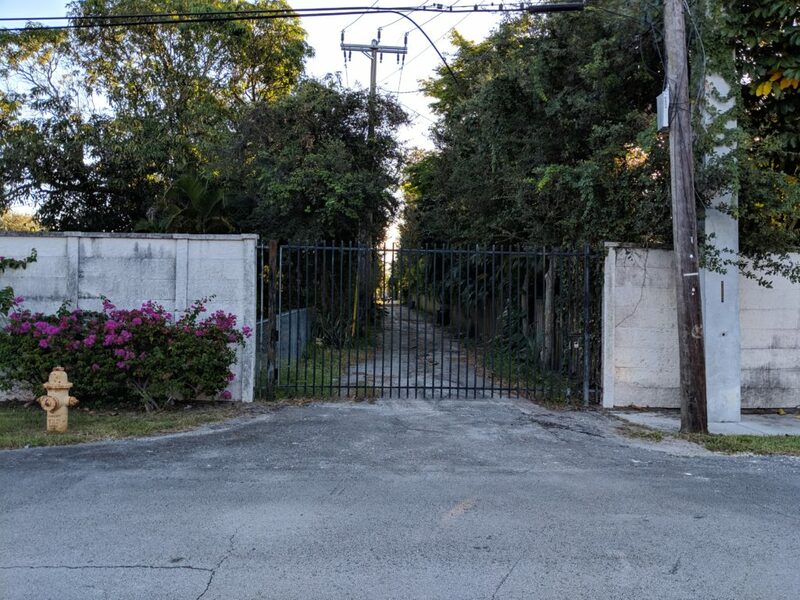 to fortify themselves from surrounding neighborhoods in an attempt to make Miami Shores safer. How do locked gates comply with ADA laws? Entire rights-of-way are now impassable. How in the world is this even legal? Americans with Disabilities Act (ADA) laws anyone? 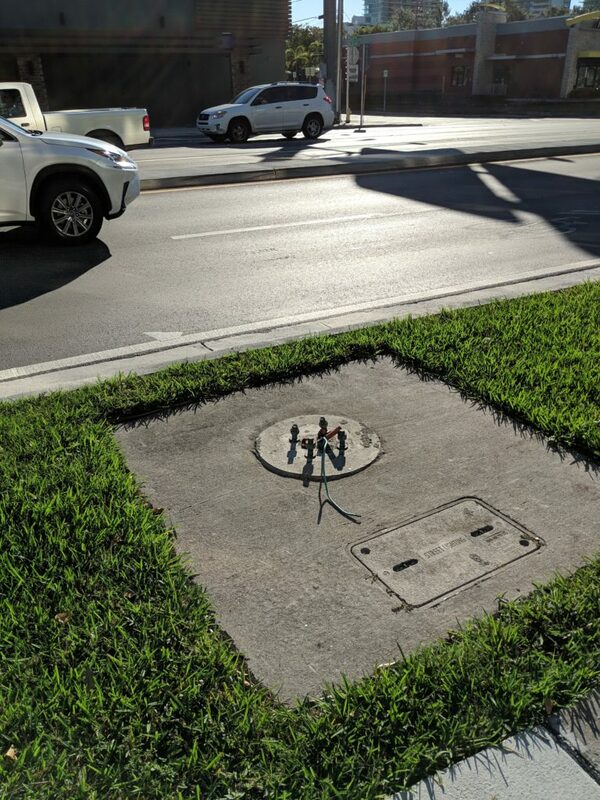 Along Biscayne Boulevard, gates with combination locks have been placed in the right-of-way. What are the negative consequences of gated communities? Gating acts as a border that fragments the city, forcing pedestrians and cyclists to walk or bike block out of their way to arrive to their destination. City residents are denied access to public infrastructures and spaces when the gates are locked. Gating forces vehicles on to other open streets causing increased traffic and speeding on non-closed streets. Gated communities can create social paranoia due to the security-oriented life-style. Gating can lead to a relocation of crime outside the gates and within adjacent non-gated communities. Gating can have a negative impact on property values in non-gated adjacent neighbourhoods. 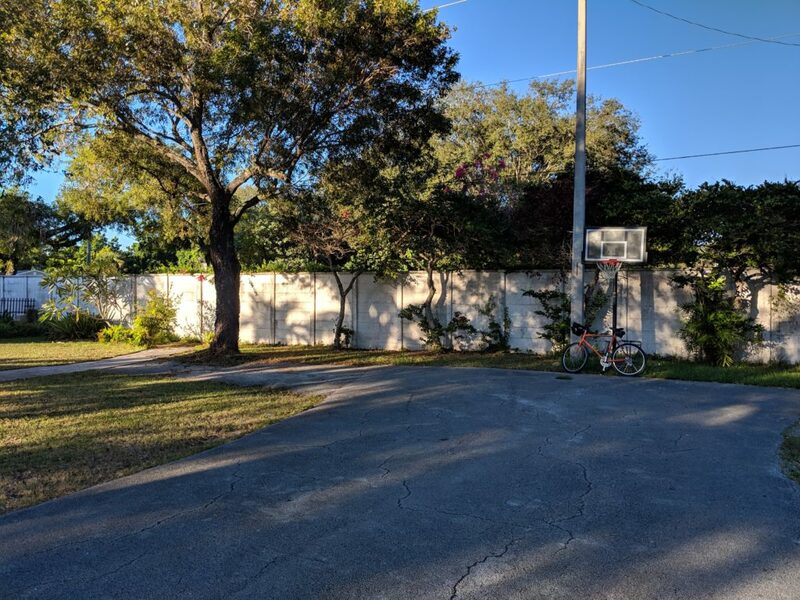 This can lead to further preventive gating developments in a neighborhood, as former non-gated communities have to fit gates in order to maintain their property values and avoid crime relocation. Seems like now is a good time to start reclaiming our public rights of way. There is little to no evidence that gated communities are safer. What do you say Miami Shores? Written by Felipe Azenha & filed in Community.